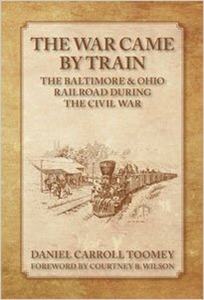 Daniel Carroll Toomey will present his book, War Came By Train: The Baltimore & Ohio Railroad During the Civil War, Commemorating the Sesquicentennial of the American Civil War 1861-1865. Beginning with the B&O’s reaction to John Brown’s Raid in 1859 and ending with the demobilization of the Union Army in 1865, Toomey’s new book is a highly detailed yet readable history of America’s most famous railroad during the Civil War. The author blends the overall strategy and political aims of that time period with the battles, raids and daily operational challenges of a Civil War railroad. He introduces an array of little known personalities who worked for, attacked, defended or traveled on the B&O Railroad. He also shows in numerous instances how the railroad and the telegraph combined to conquer time and distance on the battlefield and ushered in the era of modern warfare with the introduction of armored rail cars, hospital trains, and large scale troop movements. Daniel Carroll Toomey is a seventh generation Marylander whose first American ancestor taught school for John Carroll of Carrollton. He is a graduate of the University of Maryland and the author of several books including The Civil War in Maryland, Marylanders at Gettysburg, and The Maryland Line Confederate Soldiers’ Home. He is also co-author of Baltimore During the Civil War and Marylanders in Blue, all of which were published by Toomey Press. Mr. Toomey has lectured for a number of historical organizations as well as the National Park Service and the Smithsonian Institution. His course “The Civil War in Maryland” has been offered at a number of local colleges. He has also contributed to radio and television programs and two Civil War battle videos. He is a member of the Surratt Society, and the Maryland Arms Collectors Association, and the Company of Military Historians. He serves on the Maryland Military Monuments Commission and was project historian for the Maryland Memorial erected at Gettysburg in 1994. Dan Toomey has won numerous awards for his historical research and exhibits including the Gettysburg National Battlefield Award in 1985 and was the 2001 recipient of the Peterkin Award given by the National Park Service at Fort McHenry for his many contributions in the field of research and preservation. He is currently the guest curator at the B&O Railroad Museum for the five year exhibit, The War Came By Train, commemorating the 150th anniversary of the Civil War.